Master of One Part III: @ChadAHolloway talks to Men "The Master" Nguyen about cheating allegations. 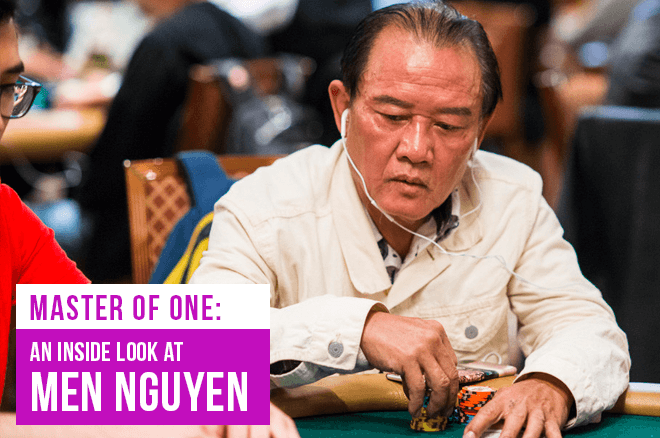 This is the third article in a five-part series in PokerNews’ Master of One series on Men “The Master” Nguyen. 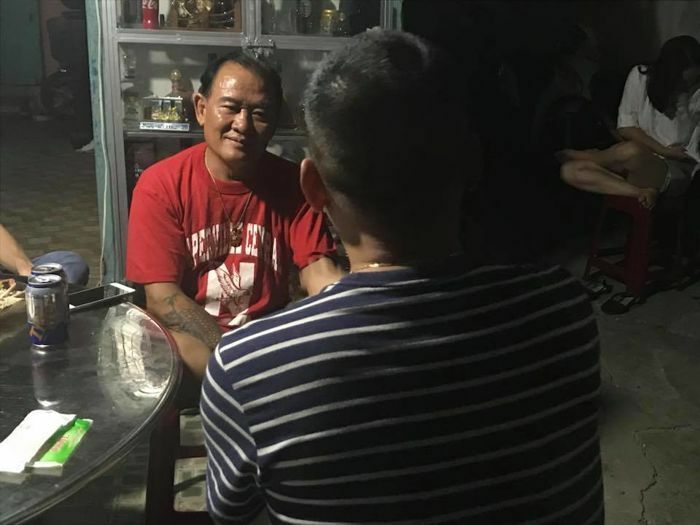 In Part I, author Chad Holloway highlights his journey to Vietnam alongside Men Nguyen began, while in Part II he talks about how Nguyen’s poker origin, charity work, and more. There is no denying Men “The Master” Nguyen doesn’t have a great reputation in the poker world. The three main marks are that he drinks too much at the table, mistreats dealers, and most seriously, has cheated to succeed. On several occasions during my trip to Vietnam, I broached the subjects with Nguyen. He copped to the first two, but vehemently denied the third. You see, at the height of his popularity, Nguyen took on students, most of which were fellow expat Vietnamese players looking to replicate his success. They soon dubbed their teacher “The Master” and traveled with him around the country. They became an entourage of sorts. Nguyen: “If you look at all the talk about cheating, if you look it’s not true." In exchange for lessons, Nguyen’s students were expected to share their winnings. Chip dumping allegations may surround him, but Nguyen has never been banned from a venue for doing so nor have any instances ever been proved. Men "The Master" Nguyen talks about the controversies. One of the most infamous Men Nguyen stories centers on allegations that he was caught with tournament chips in his room. Some versions of the story go as far as saying he was caught with an entire suitcase full of them. It supposedly took place nearly two decades ago at Connecticut’s Foxwoods Casino. As the story goes, Nguyen was there with his students, who were all asked to leave after security paid a visit to their room. Rumor quickly spread that chips had been found and it was assumed said chips were destined to be introduced into the tournament. Nguyen doesn’t deny that he was kicked out of Foxwoods, but he claims it has nothing to do with poker. So, was Nguyen telling the truth? As it happened, Women in Poker Hall of Famer and industry veteran Kathy Raymond was the poker room manager at Foxwoods at the time. I reached out to her to get the facts straight from the horse’s mouth. So, one of the most infamous stories surrounding Nguyen isn’t true, though it seems even he is fuzzy about the details (a common occurrence for the man). It makes you wonder how many other stories have either been fabricated, taken out of context, or blown out of proportion. 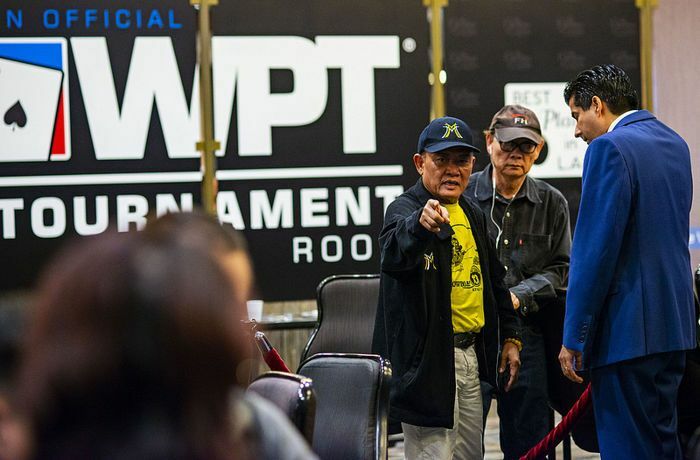 Along those lines, noted poker podcaster Joey Ingram devoted an entire show investigating Nguyen and ultimately concluded that while there are plenty of stories and allegations, there isn’t anything in the way of proof. 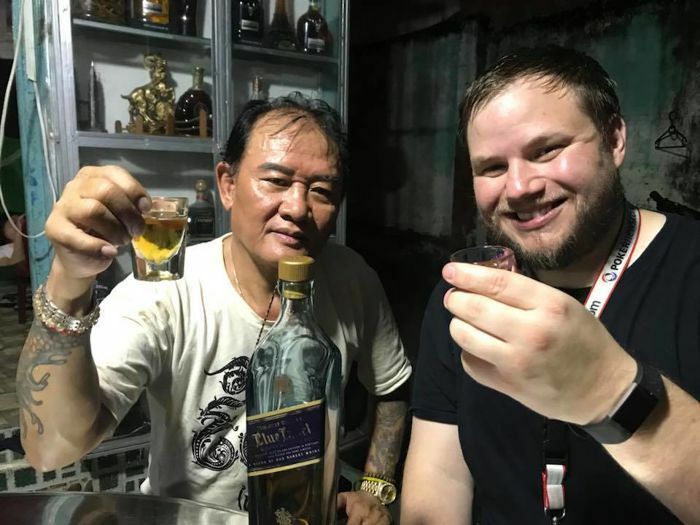 Men "The Master" Nguyen and author Chad Holloway share a drink. While there may not be proof of outright cheating, proof of dealer mistreatment certainly exists when it comes to Nguyen. There’s no denying it, and he doesn’t. It becomes clear while discussing the subject that Nguyen isn’t a big fan of dealers. It seems his perspective is “The Master” knows best, and in the past, it’s gotten him into hot water. He couldn’t let some things go, and in turn, said and did things he shouldn’t in terms of dealer treatment. Nguyen: "The dealers always say that, they say I’m mean to them. I don’t want to have problems." Nguyen claims to have changed his evil dealer ways, which he admits were more often than not fueled by alcohol. Steve Sung in the WPT Gardens. (Image courtesy of WPT). The no drinking didn’t seem to apply to the WPT Gardens Poker Festival, where he finishing third for $270,430. It was there his behavior – most notably passing out at the table and trying to make illegal raises on multiple occasions – got him into hot water with tournament staff, who issued him a one-round penalty. One hand stood out in particular. It happened when Steve Sung raised preflop holding ace-jack and Nguyen defended his big blind with nine-seven. The flop gave Sung trip jacks and Nguyen a gutshot straight draw. Nguyen check-raised and Sung called to see a six on the turn, which improved the former to an open-ended straight draw. Nguyen bet 225,000 and Sung moved all in for 435,000. Nguyen dropped in two 100K chips as if to call and Sung tabled his hand. Nguyen then picked up the chips and claimed he’d accidentally dropped them and hadn’t intended to call. “I no do nothing,” Nguyen responded. “I no do nothing. I bet you $1,000,” Nguyen again said. “I’ll bet the prize pool on it,” Sung answered. The tournament staff ruled it a call and Nguyen was forced to put in the chips. Another six on the river gave Sung a boat and the double. It seemed like a deliberate angle, but either way, it painted Nguyen in a bad light. I asked him about it and much to my surprise he didn’t have any recollection of the incident. I don’t mean he tried to deflect and feign ignorance, I mean he genuinely had no idea what I was talking about. I then pulled up the hand in the live update on my phone and allowed a clearly perplexed Nguyen to read the report. 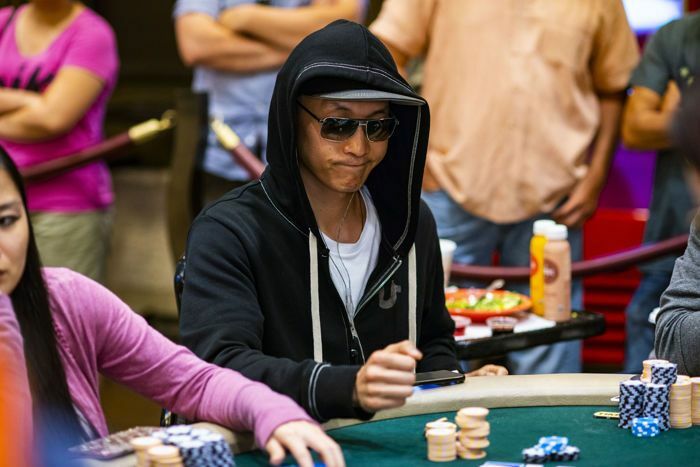 Nguyen has shot angles and abused both dealers and other players at the tables. There are no shortage of stories online. Not surprisingly, Nguyen’s reputation follows him around and he’s occasionally confronted about it. “Once when playing in the UK they ask me, ‘Men, people say you cheat?’ Instead of saying no, I never do, I say, ‘How can I cheat?’ I say it’s a rumor. People get jealous,” Nguyen said. He also described an incident from this past summer at the WSOP in the high-stakes King’s Lounge where he was playing $75/$150 Stud Hi-Lo. Be sure to come back tomorrow for Part IV of this five-part series on Men “The Master” Nguyen where you’ll learn about his divorce, family life, and how his life has transformed since 2010.